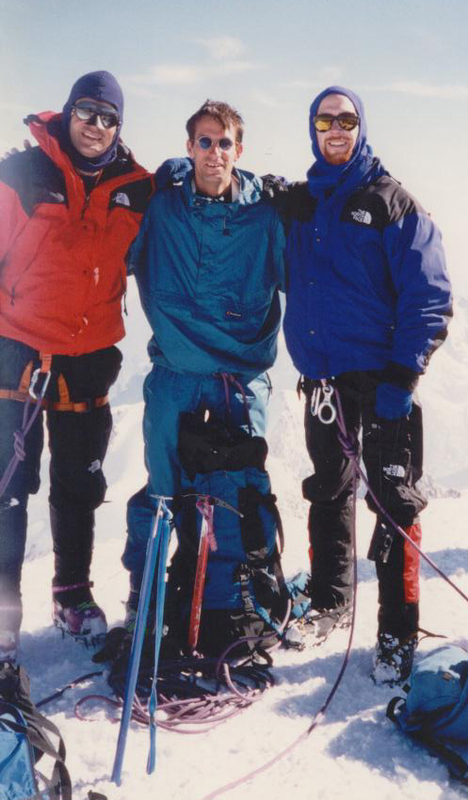 In the late summer of 1994, my buddy, Pete and I did a week-long, express tour of the French & Swiss Alps with a goal of summitting on what we considered the ‘Big Three’: Mont Blanc, The Matterhorn, and The Eiger. We were experienced rock climbers but had little mountaineering experience. But with a blood chemistry high in testosterone and adrenaline, and imbued with the full spirit of adventure, we were determined to make it happen. The only obstacle we recognized was the lack of information. In 1994 there wasn’t much of an internet and no Amazon.com to use to find answers to our questions about how to get this done. The guiding services didn’t want to help, for obvious reasons. So our plan was to rent a car, buy a map, and follow road signs to the city nearest each peak. Once at the nearby city, we planned to look for a tourist center or a climbing store or even a guiding service where we’d ask questions and buy information necessary to accomplish our goals as quickly as possible. We were hoping to do all three peaks plus a bit of bouldering outside of Fontainebleau before our ticketed departure from Paris ten days later. 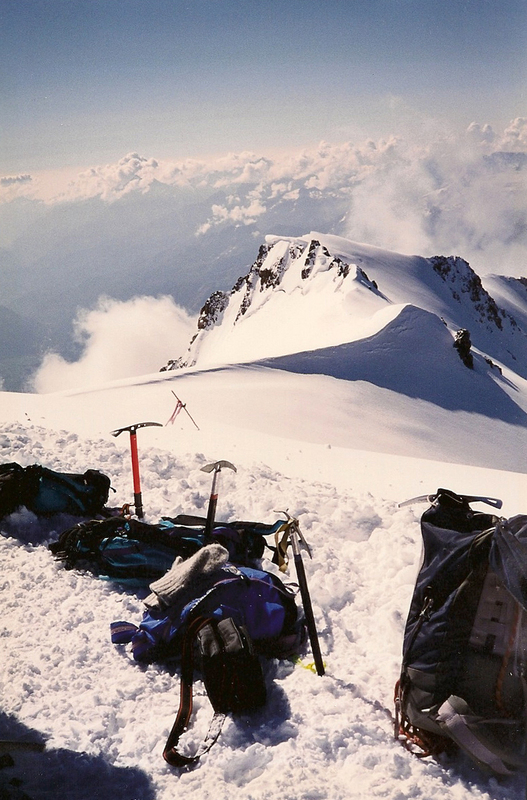 We landed as scheduled in Geneva, Switzerland, and drove into Chamonix to find out how best to climb Mont Blanc, and get the adventure started. 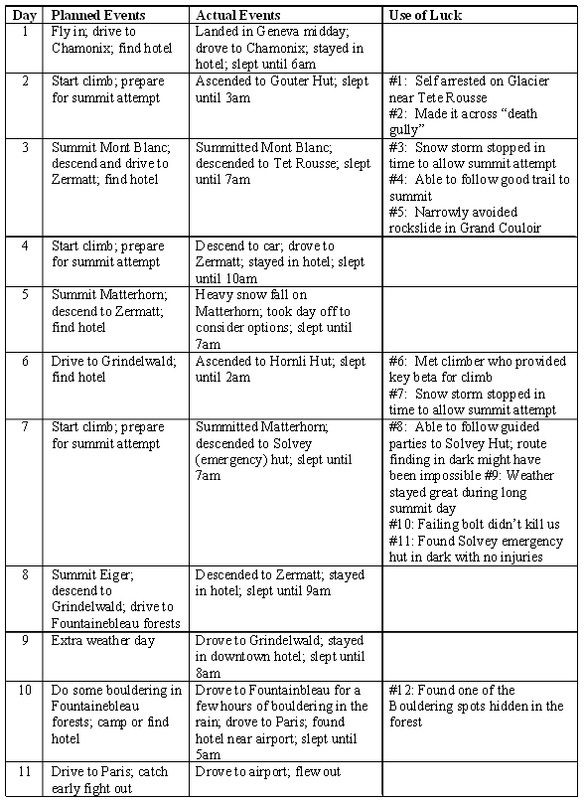 We had allotted 3 days for Mont Blanc, including the descent and drive to Zermott; we needed a fast start. It turned out that finding other climbers or tourists was the only way to find information; the locals were both unpleasant and unwilling to help. I guess skimping on the “casual wear” was a mistake. 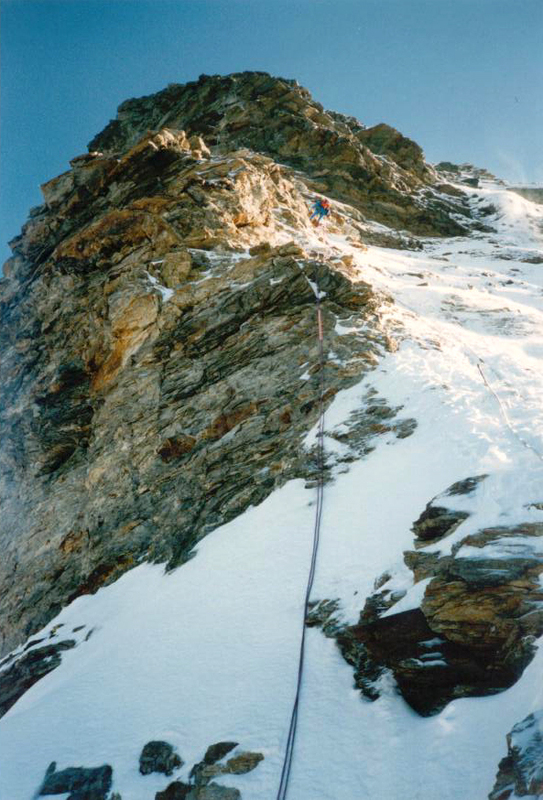 Eventually, we determined that (1) the Goûter route was the least risky for beginner mountaineers (low crevasse risk) and (2) there was no way to get a reservation at the Gouter Hut in the near future. Since we had no time to spare, we took a reservation at the Tete Rousse, a lodge further down the route that would add several hours and the most dangerous section to the summit day. But that was just a backup. 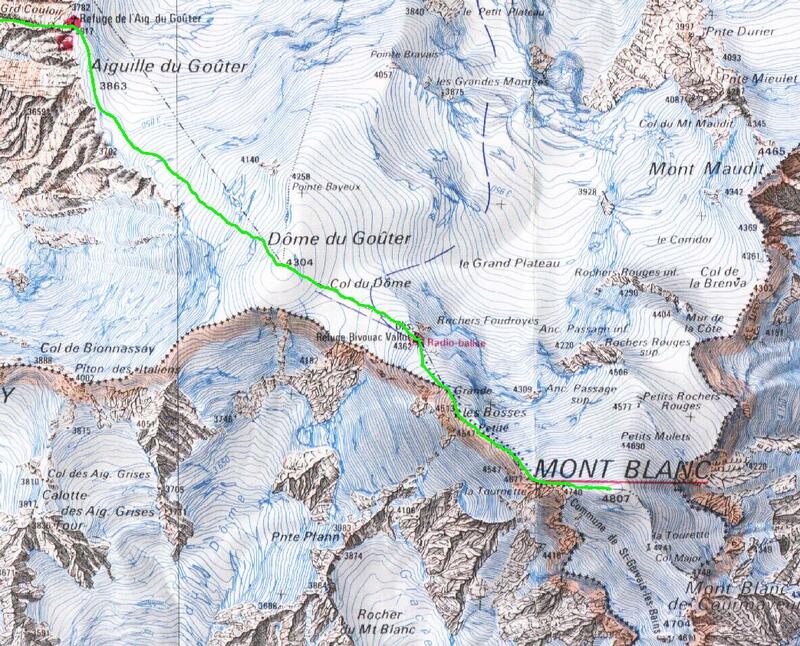 The real plan was to go to the Gouter Hut and hope for an empty corner to claim and bivy outside if necessary. The problem was the extra volume and weight of the bivy gear. In a mad rush to make room for the tent before starting up the mountain, I unpacked everything I thought I could live without. I cannot explain how I thought I could live without my helmet, my liner socks, or my spare socks; but I did leave them behind. Even still, the pack was so heavy I could not lift it with one arm. My head, still being attached to the top of my body, managed to come along despite being useless. 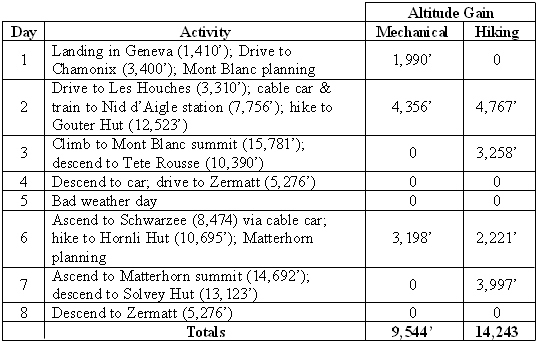 We checked out of our hotel and drove to the town of Les Houches (3,310′) where we planned to take the Bellvue cable car to Bellevue (5,906′) and then catch the Tramway du Mont Blanc to the Nid d’Aigle station (7,756′). At first, I felt badly about being carried up 5,000 feet of mountain; it felt like cheating. But, Pete & I would still have to earn it with 7,000 feet of elevation gain over 2 days with almost zero acclimatization (me coming from Chicago @ 5oo’ elevation and Pete from Las Vegas @ 2,000′ elevation). We recognized that for us to have any chance of doing the three peaks, we’d have to live with the dishonor. 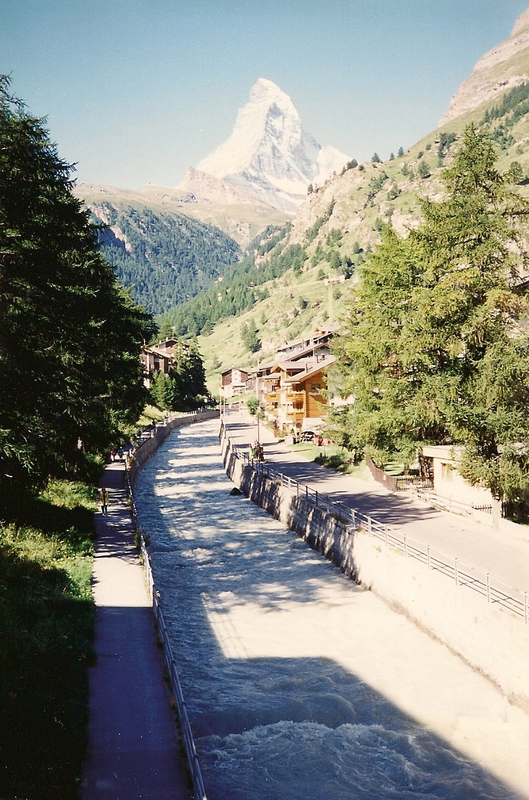 From the Nid d’Aigle station, we would have to hike & climb to the Gouter Hut (12,523′), from which we would launch our attempt on the Mont Blanc summit (15,781′). After the cable car and train ride, and after 2/3rds of the hike to the Gouter Hut, we decided to detour into the Tete Rousse hut (10,390′) to get lunch and a rest. Only 2,700 feet gained with my massive pack and I was already tired. To save some effort, we decided to follow a faint footpath across the Tete Rousee glacier where the angle was about 10-15 degrees instead of continuing for another 200-300 yards to reach a better trail on lower angle ice. I didn’t like how rapidly the angle increased toward the slip-n-slide-of-death toward and down the Bionnassay Glacier to the bottom of Mont Blanc, but that didn’t persuade me to stop and put on my crampons or get my ice axe off of my pack. About half-way across the glacier, just as I was thinking it would be a bad place to fall, I fell. With a heavy pack, I went right onto my back and started sliding toward the end of my life. I was able to flip over and just barely create enough friction to slow, and then stop, and then crawl back to the path using elbows and boot tips against tiny grains of rock imbedded in the ice. And when the adrenaline wore off a few minutes later, I found I now had a sprained thumb to remind me of my stupidity, and luck. While eating, we shared a table with a Spanish math Professor who explained how Mont Blanc was a lifetime of ambition for many Europeans; he took a week every year to climb on the massif. Pete & I discussed staying the night, but realized that 5,400 feet of elevation gain was too much for summit day. So we got back on the trail to the Gouter Hut, hoping we would not need to the use tent I was laboring to bring. After a few minutes, we reached the “Death Gully” or the Grand Couloir…a steep and loose gully with a nearly constant steam of falling rocks. Not like an avalanche, but rather like a shooting gallery. You could hear them whizzing past your ear every couple seconds; and me without a helmet. Every couple minutes, a big rock would go by; big enough to kill you. Still, the main danger was falling down the gully; so the key was to move deliberately and quickly while maintaining concentration on the footing. We got across, but it felt like a near death experience. Continuing up the steep rock climb to the Gouter Hut, the weather turned for the worse. It started to rain, which then turned into a heavy snow which lasted until 3am. And this was good and bad news. The good news was the bad weather kept many climbers from keeping their bunk reservation. We had a place to sleep. The bad news was we couldn’t head out into a snow storm in the dark; the route was supposed to be easy to follow, but not that easy. We were stuck waiting for the storm to end. The storm ended at 3am, and we set out with a German fellow who wanted to join us our team. The route finding turned out to be even easier than expected as a few guided parties got out ahead of us and blazed a trail. The only challenging aspect of the climb was the torture of freezing to death while waiting for Pete to pee every 15 minutes. The final summit ridge was wickedly steep on both sides, and the two-way traffic required frequent stepping down the slope. Scarey. The summit! We were very excited with our initial success, and pleased that the poor weather had kept the crowds away; I think there were only a dozen people on the route with us. We had climbed the highest peak in Europe (that is what we thought, anyway). It felt good. A few summit photos and our thoughts turned to the need to get down and head over to Zermott. Down we went, following the trail back the way we came. Reaching the Gouter Hut, we quickly packed up for a run to the Nig N’Agile train station to catch the last train to Bellvue. But when it was time to get my pack on, I could barely manage it. 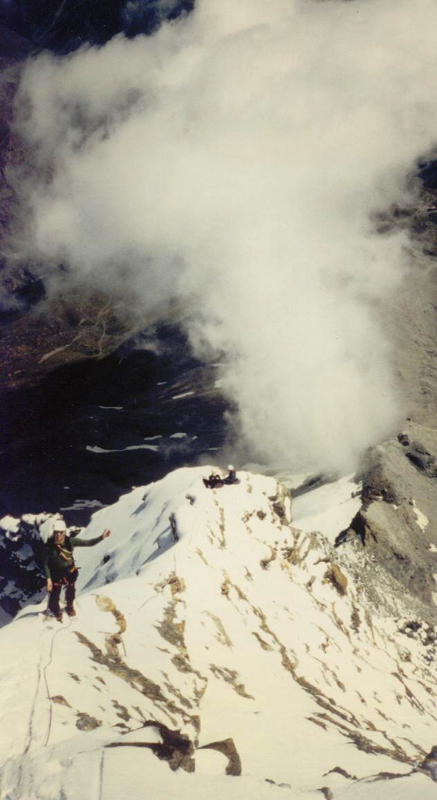 And with exhausted legs, the steep descent below the Gouter Hut seemed like inevitable death. I was just crawling. As we neared the rockfall ravine crossing (Grand Couloir), a massive desk-sized boulder 200 yards above us let loose and tumbled down the ravine. It started an avalaunche of every loose rock, all of which can roaring down. We quickly looked to see who was going to die in front of our eyes; fortunately, no one was crossing at that moment. After a short wait to recollect our nerves and make sure no additional asteroids were coming down, we crossed without incident. We missed a certain death by 5 minutes. We didn’t think we’d make it to the train station in time, and didn’t want to have to hike down the entire mountain. 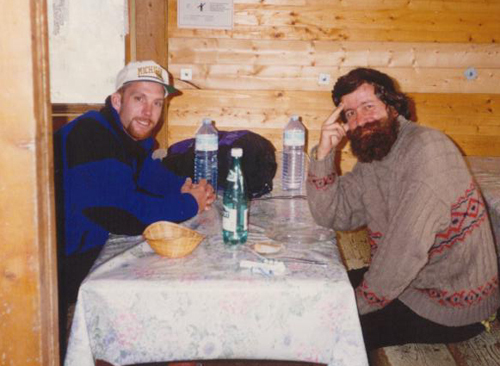 We decided to stay the night in the Tete Rousse hut; it was the happiest moment of my life up to that point in the trip. I slept like the dead. Sleeping in a room with 15 snooring men isn’t a problem when your heart doesn’t beat. Most of the inhabitants left early for a summit attempt; I didn’t stir until the need to empty my bladder ended my hibernation. Naturally, we left Tete Rousse late (waiting for someone to show up so we could pay the bill) and ran down the mountain to catch the 9am train. We arrived at 8:58am, and had a laugh about the story it would make. Then we discovered that rock fall on the tracks would delay the train until noon. Pete & I had to hike down an additional 2 hours to the cable car. Once at the rental car, I was able to inspect the damage to my feet. You may remember that I left behind my liner socks and my spare socks; so, my feet had been wet for 3 days and 7,000 feet of elevation gain and loss. As I peeled off my socks, much of my skin came off as well. I was now seriously handicapped for the rest of the trip. We needed to get to Zermatt, but I needed to get some medical supplies. We drove into Chamonix so I could pickup some antibiotic ointment and the French equivalent to jumbo band-aids. While in town we discovered that 11 climbers had died on Mont Blanc due to lightning and serac fall while we were on the mountain. One mountain down, two to go (Matterhorn and Eiger). 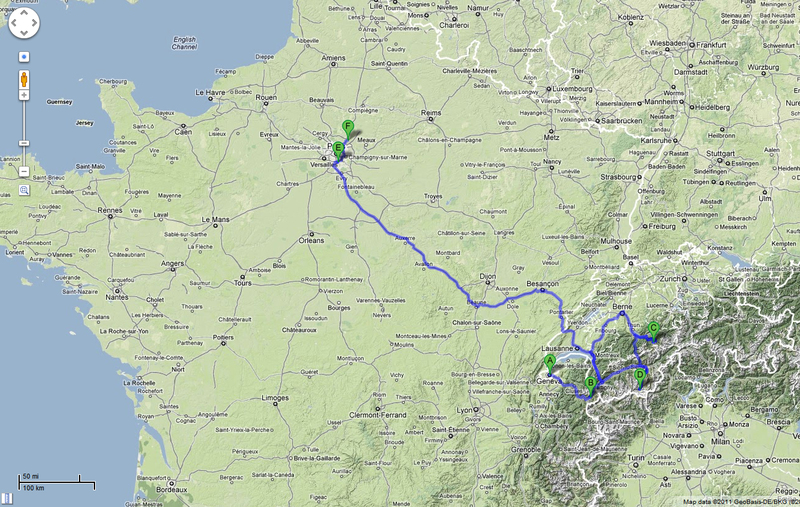 Driving in France and Switzerland is not a simple matter if you are trying to navigate by map. As best as I could determine, they do not number or name their highways. Instead the signs only indicate that it is a highway (thanks!) with a symbol and name a city along the way to indicate a direction. Well, this approach works very poorly for visitors who do not know any of the cities in the area. But despite the poor road signs, Pete’s relentless asking of questions to determine “how much longer will it take”, and my inability to find city names on the rental car map (so we saved a few bucks), we managed to figure out that we had to take a train to get to Zermatt (no cars allowed) and found the train station to get us there. I was in a frenzy of determination not to bring too much weight to the Matterhorn. Pete & I put our inconsiderable heads together to figure out what to leave in the car. Unfortunately, we talked ourselves into believing that we wouldn’t need our axes since the Matterhorn was a rock climb, not a glaciated peak. It was a decision we’d regret terribly. But I did remember to bring socks and a helmet. As we exited the train station in Zermatt, we were amazed to find ourselves in a real life Disneyland. It was beautiful with only horse drawn carriages moving through the cobblestone streets. And the Matterhorn was a massive tooth piercing the sky! It was the most impressive mountain I had ever seen. 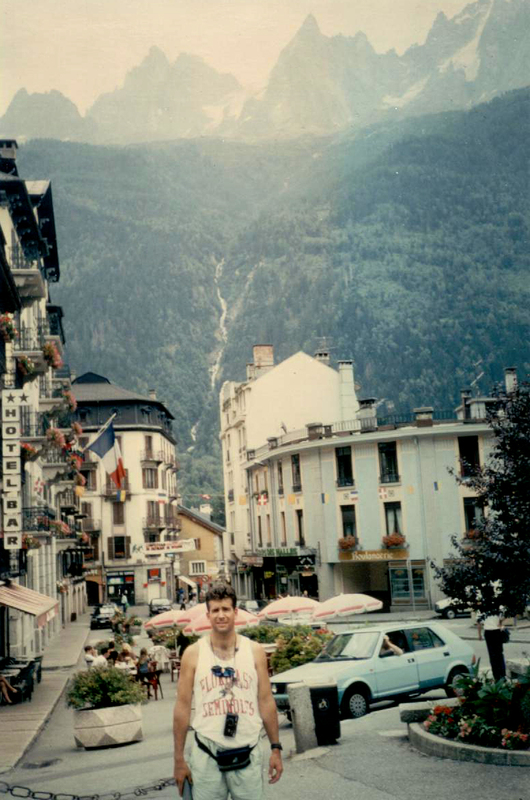 Pete & I were ready to go after the Matterhorn immediately. But the weather did not cooperate. Our plan to climb on Monday with a Sunday approach was trashed by the weather report. Rain/snow Sunday and Monday, good weather on Tuesday and Wednesday. So we agreed to wait one day. With a day to kill, so we turned into tourists. 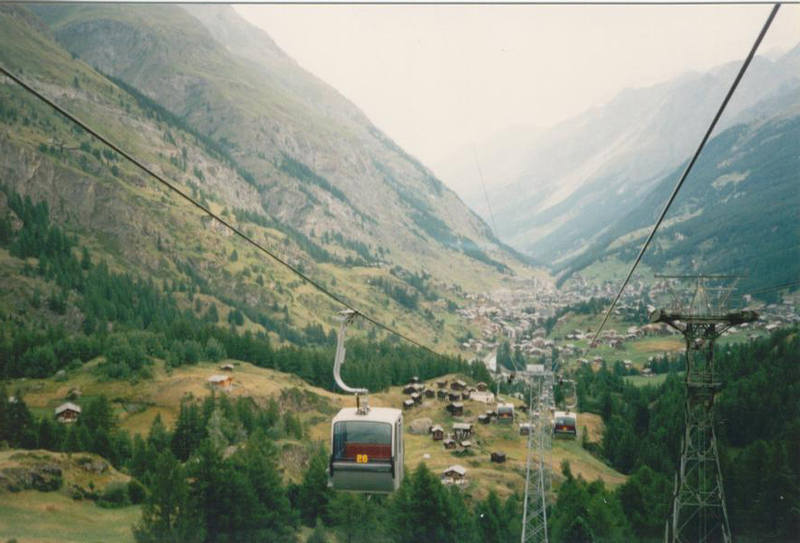 And, Zermatt is a fine place to spend a day with nothing to do, as long as you don’t buy much. Wandering around, we stumbled upon a graveyard in the middle of town. I figured it was the ancient graveyard of the old village, but it turned out to be much more interesting and relevant. 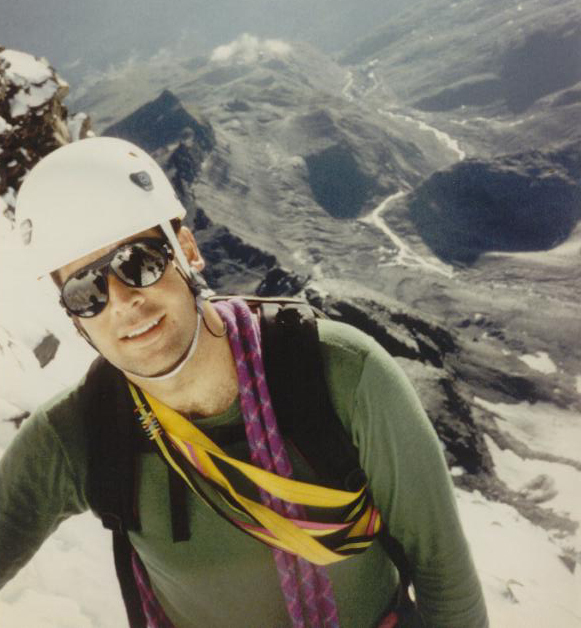 It was mostly a graveyard of climbers who have died on the Matterhorn; a sampling of the approximately 500 people who have died in the effort. It was a sobering experience. What we could not find was any information on the climb. Again. The guiding service was happy to charge us a lot of money to show us, but no information was for sale. Again. I understood that it was their livelihood. 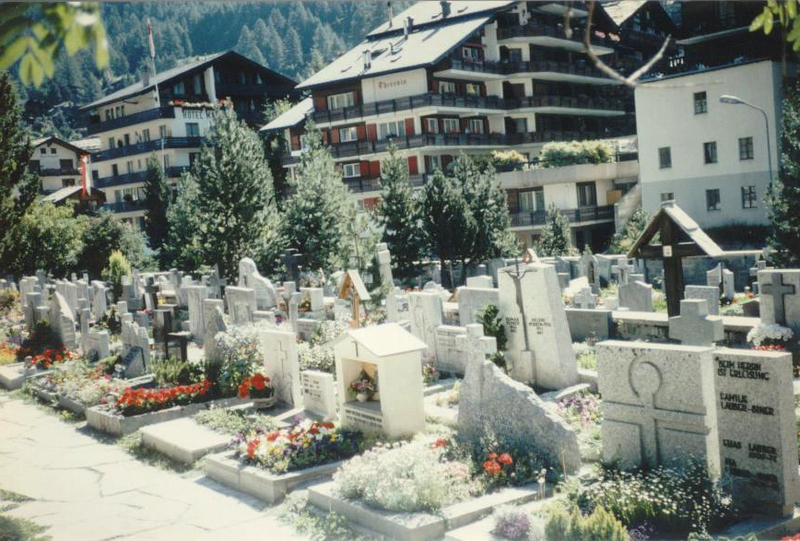 This wasn’t really Disneyland, but I didn’t want to be buried in Zermatt. At least not yet. Late in the day, we found a great bar, The North Wall Bar, for dinner and collecting information about the climb. One of the bar tenders was an American; he suggested that we use the Solvey Hut as a high camp. The idea was to climb to the Solvey Hut in the few good hours of weather, and then proceed from there the next day. I loved the idea, considering our limited available time. Pete thought it would be better to wait for good weather. We agreed that in any case we should head up to the Hornli Hut the next day. That way we’d be in position to find out more about the climb from other climbers and be able to execute whatever plan we could come up with. 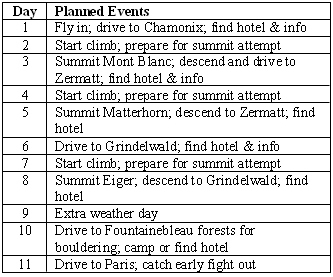 The plan for the ascent, roughly, was to take the Schwarzee cable car to the Schwarzee Station (8,474′), and then do the 2 hour hike to the Hornli Hut (10,695′) where we’d spend the night. 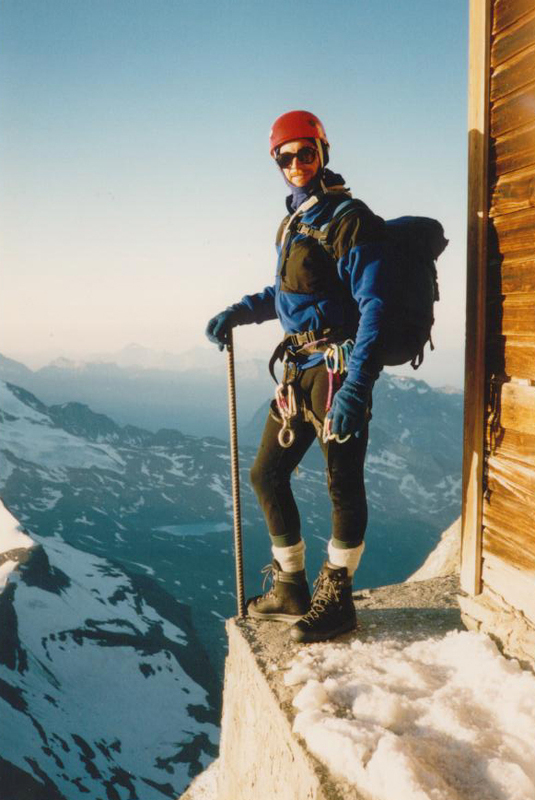 Then climb up to the Solvey Hut (13,123′) on the way to the summit of the Matterhorn (14,692′). Naturally, the devil is in the details. When we got to the Schwarzee Station after the cable car ride, the sky opened up with wet snow/rain falling heavily. We decided to wait it out in the restaurant. Pete bought some food; I pulled an orange out of my pack. The unpleasant locals working behind the counter yelled at me about their profit motive. I spent some money on something useless and they shut up. Hell, we were the only people in the place; it wasn’t like I was using a chair that could have been used by someone else. While we waited for a break in the precipitation, in walked Chris from Liverpool, England. He had just soloed the Matterhorn and was able to give us the detailed route information we’d been looking for. However, he also told us that it had snowed very heavily Sunday night and the mountain was in no condition to climb. During a break in the weather, Pete and I pressed on to the Hornli Hut with a quick 1.5 hour hike (vs. 2.0 hour standard). As we arrived, the weather deteriorated again and the snow continued to fall for several more hours. We were very worried about the conditions, but hoped for the best and spent the afternoon processing the information we had and planning for our ascent. After the snowfall ceased, the weather did us a favor by turning warm. The wet snow and rain did not freeze up, so we decided to go for it at 3:30am and followed closely on the heels of a couple of guided teams though the tough route finding section below the Solvey Hut. Unfortunately, these were slow teams, so it took over 4 hours to reach the Solvey Hut (a good time would be 2 hours). So we were behind schedule already. But on the other hand, nearly every climber turned around at the Solvey Hut. We had the mountain to ourselves and a couple from New Zealand, Chris and Kat. Above the Solvey Hut, it was a snow climb; at least a foot of snow covered everything, and Pete & I without ice axes. We put on our crampons & roped up, then we headed upwards. With the late hour and our slow progress moving over slippery and unseen rocks, we were making a huge bet on the weather staying good. Through the upper Mosley Slab and on up the ridge proper we went, very slowly. And when we reached the shoulder area, progress was even slower. The fixed ropes were an iced over nightmare. Using gloves on the thick, icy ropes without solid footing due to the deep, loose snow was an exhausting exercise. On the steepest rock (40-50 degrees), there was no snow, but the progress was still slow despite our simul-climbing. And on the final snowfield, we could only crawl up by kicking our boots and jamming our hands into the snow to find holds on the underlying rock. But we made it. We reached the Matterhorn summit at 2:50pm. We were running very late, but we just had to take in the spectacular views and a few glory photos. A few minutes later, Chris & Kat joined us on the summit. We had taken over 11 hours to do the normal 5-6 hour ascent, and we still had to do the descent in poor conditions. We were already doomed to downclimbing in the dark. If the weather didn’t hold, we figured our only hope for survival was to find the Solvey Hut for shelter from the cold, and wait out the dawn. Actual downclimbing was out of the question until we got below the shoulder, given the conditions. The four of us rappelled initially from the metal statue near the summit and then from whatever anchor we could find, including many fixed anchors that started to appear as the snow melted. As I awaited my turn on the last rappel by standing on a clump of snow clinging to a rock hanging over the North Face, I noticed the anchor moving oddly. With every bounce Pete took, moving down the stiff rope, the bolt separating us from oblivion was flexing up & down 45 degrees. Before the anchor could pull, Chris quickly backed it up with a tricam. Thanks, Chris. Four people rappelling down a single rope is a slow process in any case, but stuck ropes and hard-to-find anchors meant terrible slowness. It took us 7.5 hours to descend to and find the Solvey Hut by rappelling onto its roof in the pitch black darkness. At 10:30pm, tired and thirsty (no water since 3pm) we stumbled into the Solvey Hut only to find it half full of climbers looking to get an early start on the next day’s climb. The four of us crawled on top of each other in a space the size of a queen mattress and waited for dawn. At first light we were frozen, dehydrated, and exhausted. Let’s just say it was hard to get started. But by 7am we were rappelling down the lower Mosley Slab. The route finding from there was very difficult. Nothing looked familiar, as the snow had melted a great deal. And now the loose rocks were exposed. We kept knocking rocks down the mountain, no matter how hard we tried otherwise. The Matterhorn is a dangerous mountain; a pile of loose rocks. I shudder to think of the problems we could have encountered if we had climbed it crowded with people. After down climbing several sections that only rock climbers could have worked (off-route, I suppose), Pete and I were down. The climb took 30 hours, including our time in the Solvey Hut, and we had no water or food for the last 20 hours. Finding a place to pee had not been one of our problems since we didn’t need to pee. But we made it. We stopped at the Hornli Hut for some well earned food and drink with our buddies from New Zealand. The tourists and hikers at the Hut figured we had done the entire climb that morning and kept stopping by saying, “you guys are fast!” and “good effort!” I guess we looked bad enough. Two mountains down, one to go! At this point, we had climbed two classic peaks in six days requiring over 14,000 feet of hiking/climbing elevation gain, and we had used up a lot of luck to survive. I started feeling superstitious. I wondered if perhaps Pete & I had pushed our luck as far as it would go. After a night’s rest in Zermatt, breakfast with Chris & Kat, and a train ride back to our car, we drove to Grindelwald for our attempt on the Eiger. Our plan was to ascend the Mittellegi Ridge Route via a stay in the Mittellegi Hut. It was going to take a minimum of two days. Due to our earlier delays, we could just spare two days and make our Paris flight, but only if we managed to drive all night once off the mountain to get to the Charles de Gaulle airport in Paris (7 hours away). It felt like a bad bet, and I was feeling unlucky. We rolled into town just before the guide office closed. They were typically nasty and unhelpful. But they did tell us that a serious icefall danger had closed off the normal approach to the Mittellegi Ridge route. It was all the excuse I needed. 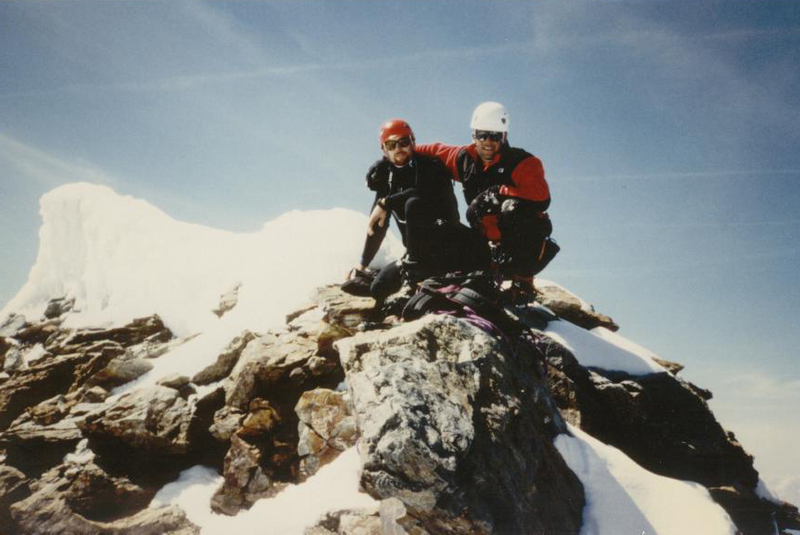 Pete agreed and we decided to eat, drink and be merry beneath the North Face of the Eiger, and be happy for what we had accomplished already. 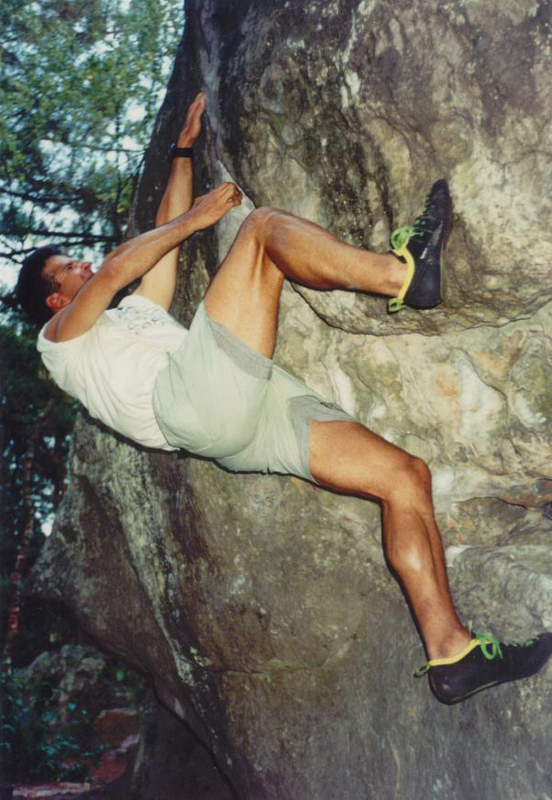 On Friday, Pete & I drove to Fontainebleau (outside of Paris) for some bouldering. We went into town to get directions, and actually got help from an official tourist office. We found one of the areas hidden in the Fontainebleau forest, and just marveled at the boulders. We climbed a few before it started raining. We decided to head to Paris to have a shower, a good meal, and a good night’s sleep before the long flight home. Up early with a bit of logistical agony to endure. First we had to figure out where to turn in our rental car that we picked up in Geneva. Then we had to move ourselves and our heavy gear to the airline check-in area. We added a bit of unnecessary complication by being late. Pete thought we should split up, with him returning the car and me getting into the checkin line with all the gear. It was a good plan except for the part about me being able to move 6 bags weighing hundreds of pounds from the front curb to the check-in line inside the airport without taking a chance on theft. As I stood there wondering what I was going to do, someone abandoned a baggage trolly next to me. Problem solved. The flights were long, but tolerable. We arrived back in the states right on time. We split up in New York’s Kennedy airport, with me going to Chicago and Pete heading to Las Vegas. It was a great trip that succeed in every reasonable way possible, and a few unreasonable ways as well. We had been very lucky. 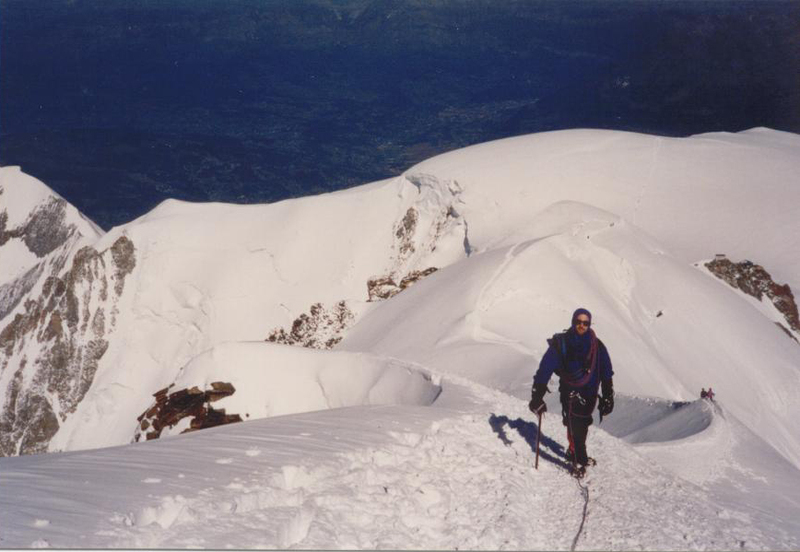 This was the first mountaineering trip that either Pete or I did without a guide; and we had not planned the trip in any detail nor had we carefully measured the riskiness of several dangerous situations before committing ourselves. I counted eleven separate instances of close calls that could have, but did not, go against us. We rolled a seven, eleven times in a row. But, instead of scaring me away from future adventure, this trip taught me the importance of planning ahead and managing risk. I never again left so much to luck. This was the beginning of my life as a Mountaineer.